Safety at height is a team effort. Anthony Dimeck addresses the necessity of thorough planning, management and competence at the work site. When we refer to working at height the subject covers a whole host of scenarios, all of which involve employees performing work duties that could put them at risk of a fall. Falls from height account for almost 40% of workplace fatalities. If we combine this statistic with the fatalities caused by falling objects, it becomes clear that working at height is probably our biggest challenge within the workplace. We should also consider that even when a fall does not result in a fatality a worker can be left severely injured or disabled, no longer able to fulfil their daily routine. To understand what it means to work at height we should consider a couple of simple definitions. Firstly, how high is high? Height is any distance from which falling could cause damage. A height may not be seen as high for you, but if there is the potential to cause personal harm from falling, then that is considered ‘height’. Furthermore, height has no relation to the ground level. Whether you are working underground, overground or adjacent to an excavation, someone could still fall and sustain an injury. Another definition to consider is what is meant by ‘work’. You don’t have to be constructing something or even doing something in your usual job specification to be classed as working. If an individual is required by someone who has authority over them to move around in an area, other than a staircase, where falling could cause injury or death, then it is considered work. By working at height you are exposing yourself and your employees to significant levels of risk. It is therefore important to try to avoid working at height wherever possible. If you can find a way of removing height from the task altogether, then the working environment will be a much safer place. Unfortunately, working at height in the construction industry is often unavoidable, so systems and techniques must be initiated by employers to reduce and mitigate the hazards presented during the construction process. Any method of working at height should be regarded as a complete system, in which planning, management, competence and suitable equipment should be treated with equal importance, as each factor is dependent on the other to ensure a safe system of work. In order to ensure reasonable safety measures are taken, all tasks must be assessed and planned before work begins. It is prudent to complete a risk assessment – this is usually a legal requirement in most countries in the MENA region – and safety inspection for the working at height task, with the results recorded on paper. Inspection documents should remain on the premises at all times. They must also be updated as and when the working environment and conditions change. Once the initial safety assessment has been completed, the planning stage can begin. Planning how work can be carried out effectively, yet safely, may be one of the most difficult aspects of any working at height activity. Managers responsible for developing plans must weigh the need for productivity against any potential risks, real or imagined. Plans must assume that certain risks are inherent, and provide a means to mitigate those risks as much as possible. The best managers are able to offer a work plan that provides options to satisfy everyone's interests. Regardless of whether you're talking about risk assessment or job site and work planning, it is important to note that both are ongoing throughout the entire process of completing the work. Between the project’s progress, changing working conditions, simultaneous operations (SIMOPS), new employees, and all the other variables involved in working at height, assessments and plans are constantly changing. This requires planners and organisers to routinely evaluate job site performance and conditions, and update documentation and procedures as necessary. Every time something is updated it must be reflected in the documentation kept on site. Keeping documentation and safety procedures up to date is always prudent as auditors and the authorities will normally ask to see this. To illustrate what a good plan looks like, the following is an example from a commercial window cleaning company. Assuming they are preparing to clean a multistorey building, it will be necessary to visit the site to risk assess the potential hazards. The work will then be planned, with a record and method statement kept to document that the work was carried out safely. A competent person should carry out the risk assessment and consider how to gain access to the windows and carry out the work safely. The risk assessor might consider what’s in place already; for example, is there an enclosed rail or beam gantry that could allow a window cleaner’s cradle to be used? If not, are employees competent and trained to use rope access equipment, such as a bosun’s chair? If the work is not too high, can the cleaners use a mobile elevating work platform (MEWP) such as a cherry picker or a free standing lightweight aluminium tower, or will a fixed scaffold be necessary? Consideration must be given to the ground’s condition; for example, is it hard or soft, level or sloping? The risk assessor should also consider if other workers or members of the public may pass close by to the work area. Will the erection of exclusion zones and barriers be necessary to prevent unauthorised access? Will cleaners need their equipment and tools tethered, so that dropping of tools cannot harm people or property? For cleaning low level windows, should cleaners should use ladders or telescopic poles? If a ladder is chosen, how will stability be ensured? The risk assessor must also consider what type of fall arrest systems and equipment is appropriate. If existing equipment is being used, the inspection procedures in place must also be considered. The risk assessor will also have to consider what will happen if someone should fall while working, including the rescue procedures, training and available equipment. This would usually require a separate plan solely for rescue. A fallen worker, if arrested by a harness, has only a short time before experiencing suspension trauma, which ultimately could be fatal. Because site safety is so important, working at height situations require involvement from all levels of company management. A top down approach to worker safety means that senior management is involved in the organisational structure, at least to some degree. Management also needs to have a good idea of the types of risks their workers face and how site supervisors are implementing safety procedures to reduce those risks. Middle managers and site supervisors play an integral role in height safety, as they are largely responsible for ensuring that employees are working safely at all times. They are the ones who implement the plans developed in earlier stages of the work. They are also the people who will be held immediately responsible in the event of an accident. Having well trained and organised middle managers and site supervisors makes for a much safer workplace. Lastly, safety plans and equipment are only as good as the operatives themselves. When those doing the work are as safety conscious as company owners, they are much more likely to avoid falls from height as well as many other safety issues. Engaging operatives in the development of safe workplaces is a good idea, as it gives them a vested interest in promoting safety. When operatives feel comfortable offering suggestions and raising concerns, it in turn makes the jobs of the site supervisor and middle manager much easier. As most construction employees will work at height during some part of a project, employers often use a generic working at height training package – and this is often combined with the initial employee induction. It is good practise for employees to attend training prior to their first engagement on the construction site. If we consider some specialist fields where exposure to working at height is a daily part of the job, such as rope access and the erection and dismantling of scaffolding, there is a need for more intensive training and regular refresher courses to enhance the competency levels of employees. While good scaffolding provides a safe means of working at height, erecting and dismantling scaffolding can be hazardous in its own right. There are three grade levels for scaffolders: trainee, basic and advanced. It will normally take six months to a year for a trainee to progress to the level of basic scaffolder, and then at least another year to progress from basic to advanced. 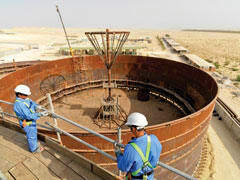 In the MENA region, some of the larger scaffolding companies have set up their own training establishments. These are usually affiliated to a third party training organisation; for example, the Construction Industry Training Board (CITB), a UK based organisation. A third party organisation should monitor the training establishments and quality of the training delivered by the accredited trainers. Each trainee should have an up to date portfolio which must be monitored to ensure it is kept up to date. Within the variety of work at height methods available, rope access is an accepted technique - provided it is used in appropriate circumstances. A rope access system is a safe method of working at height, in which ropes and equipment are used to gain access to and egress from the workplace. There are three levels of rope access technician. All worksites operated by IRATA (Industrial Rope Access Trade Association) member companies have at least one Level 3 rope access supervisor on site. This person is responsible for the safety of the rope access systems and the Level 1 and Level 2 rope access technicians who work under their supervision. A rope access team typically consists of at least two rope access technicians, one of whom must be a Level 3 rope access supervisor. Lone working is not allowed. We have already touched on equipment in previous sections. One of the most crucial pieces of equipment used by scaffolders and rope access technicians is the full body harness. Designed to arrest the fall of a worker, this is the most commonly used personal fall protection device. Full body harnesses are rigged to prevent workers from free falling a distance of more than six feet and hitting the ground or a lower platform. They are designed to be tied off or anchored to a fixed structure that is above the worker’s body and are capable of supporting 5,000lbs of dead weight. Harnesses are designed to be used with safety lanyards. Many companies and work sites require an increased element of safety and stipulate that the harness must have a dual lanyard incorporated, commonly referred to as 100% tie off. It is commonly assumed that the main hazard when working at height is people falling onto plant, equipment or the ground, so much so that sometimes we forget about the hazards associated with falling objects and equipment. Every year people incur injuries, minor or fatal, as a result of being struck by falling objects. Before we start a task we should take a few moments to assess whether, if dropped from height, the equipment, materials and tools we are using could result in a person below sustaining an injury. The potential for injury from dropped objects can be analysed using the Dropped Objects Risk Matrix. What is noticeable about the move from elimination to PPE is that we are moving from the safe place to the safe person. This means there is more reliance on competency of people working at height and constant monitoring of the operations. While we are engaging people working at height we should always consider the potential of falling objects.